The evolution of the manipulate festival of visual theatre has seen it develop from its roots in puppetry and more physical forms of performance into an annual celebration of international and Scottish theatre that pushes at the boundaries of form, entertains and reimagines apparently familiar ideas and stories, lending them an urgent, contemporary meaning and relevance. Artistic director Simon Hart has pursued this vision for over a decade, and throughout this time has supported Scottish artists - both through workshops and main-stage productions - while exposing audiences to the best of visual theatre from around the world. For 2019, Scotland is represented by Karl Jay-Lewin and Matteo Fargion, Glasgow's Tidy Carnage, Mele Broomes, whose Void has already shaken audiences both at Tramway and in its site-specific version, Fiona Oliver-Larkin, Hopeful Monster and Al Seed – as well as performers in the Surge: Pitch event and the final evening's Clown Cabaret. Ranging across choreography, puppetry, clowning – in the case of Al Seed, a distinctive blending of storytelling, physical theatre and bouffon – capturing the dynamic landscape of Caledonian experimental performance. After its success of last year's finale, the Clown Cabaret Special Edition will again conclude the festival. Drawing on the highlights of the Clown Scratch Cabaret which has been supporting Scotland's clowns over the past three years with regular visits to Edinburgh's Roxy and Glasgow's Tron, as well as other venues. 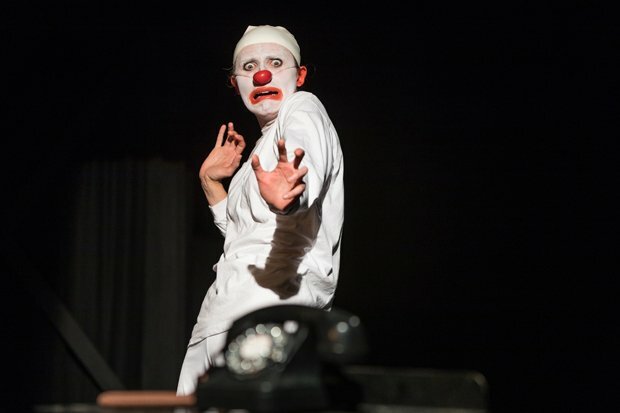 Hart recognises that 'the consistently growing enthusiasm for and knowledge about clowning techniques adds greatly to the development of physical and visual theatre in Scotland. As more as more Scottish practitioners acquire and hone these techniques they do often then utilise them in more "serious" theatre-making.' With Al Seed's Bridges of Madness reminding audiences of one of Scotland's most established clown-influenced performers - now with the backing of 'the world's first eighteenth century jazz-blues band', manipulate's platform covers the rising stars and the veterans. Across the years, however, the uncompromising experimentation of the festival's companies has been tempered by their use of familiar narratives: Sleeping Beauty and Macbeth both received visual theatre remakes in 2019, while Void draws on the dystopia of JG Ballard's novels and science provides the material for Green Ginger's Intronauts and Wunderkammer from Germany's Figurentheater Tuebingen. Puppet Animation Scotland collates a collection of worldclass animation, puppetry and related performing arts of all styles and techniques. The 2019 event will have its base at the Traverse Theatre in Edinburgh, with additional performances in venues across the country. Pitch is an innovative physical theatre showcase featuring an impressive line-up of established and emerging performers presenting physical theatre, comedy, dance and high drama in development. Artists perform new or in-development performance pieces using physicality, circus skills, comedy, clowning, drama and music. A fantasia of becoming an action hero? Can the show always go on, no matter how full one’s hands get? Perhaps a champion will emerge if the fates allow? Or will dark temptations vampirishly vacuum the dreams of a clown? And scatter them sheepishly before an ominous telephonic tone? What does it all mean…!?! Al Seed resurrects his puffed-up, wide-eyed monstrous storyteller, and brings a few musical friends along.